An Ode to (the) BOB – tabard's.in! 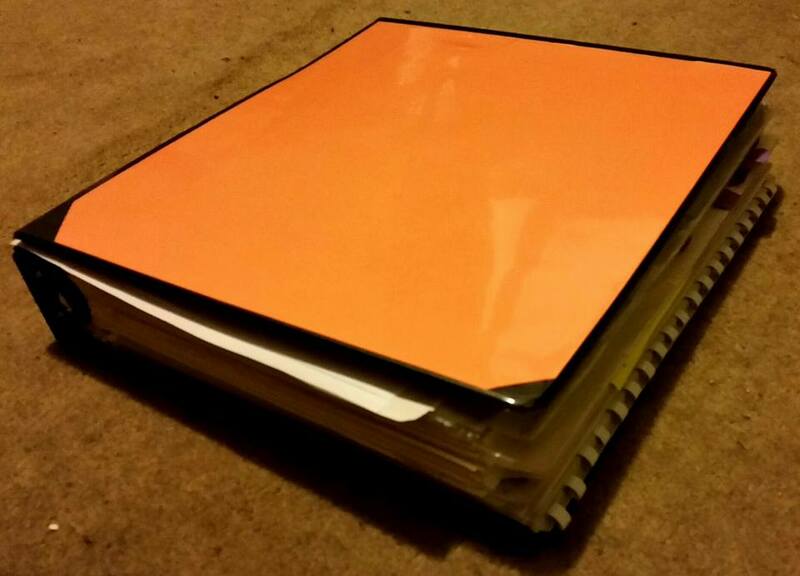 In its original incarnation, it was a thick sketchbook with orange fabric on the outside cover, funny/memorable quotes from game sessions on the inside, notes and character doodles scribbled throughout, and loose character sheets and more notes sandwiched between its pages. It positively bristled with papers that stretched the binding to its limits and beyond, and a few years ago, I finally had to admit it was falling apart. But I couldn’t just get rid of it or replace it. There were too many good stories in there. So I sliced off the spine, three-hole punched all the pages and it evolved into 2.5in binder with (surprise surprise) orange inserts for the covers and spine, and plenty of room for the handwritten pages, printed character sheets in sleeves, doodles, notes, reference sheets, and other gaming ephemera that had previously been scattered across multiple books/notebooks. The Big Orange Book lives on! And this isn’t even its final form, since it’s so packed with stuff AGAIN that the spine is once more slowly splitting with use. Only the future will tell what it’s next evolution may be. Orange duct tape reinforcement? Bigger binder? No one knows!